Written, directed, and starring Charles Chaplin, The Gold Rush is the story of a prospector seeking gold in the Klondike as he also falls for a girl during his journey. The film is about the period during the Gold Rush about individuals seeking to find gold where Chaplin brings his beloved Tramp character into that world. Also starring Georgia Hale, Mack Swain, and Tom Murray. The Gold Rush is a whimsical comedy from Charles Chaplin. Set in Alaskan gold rush of the late 1800s, the film explores the journey of a prospector seeking gold in the Klondike where he meets another prospector and a fugitive in a cabin. The three would try to survive the cold where the Tramp would later go into town as he falls for a young woman and hopes to get another chance to find gold in the Klondike so he can give her a good life. It’s a film that has a very simple premise yet Charles Chaplin adds a story of determination and ambition into the mix where the Tramp would meet some good people in his journey like the prospector in Big Jim McKay (Mack Swain) and the saloon girl Georgia (Georgia Hale). Yet, there would also be individuals like the fugitive Black Larsen (Tom Murray) and local ladies man Jack Cameron (Malcolm Waite) who would be a challenge to the Tramp. Yet, Chaplin would find ways for the Tramp to persevere while helping those who have been good to him. 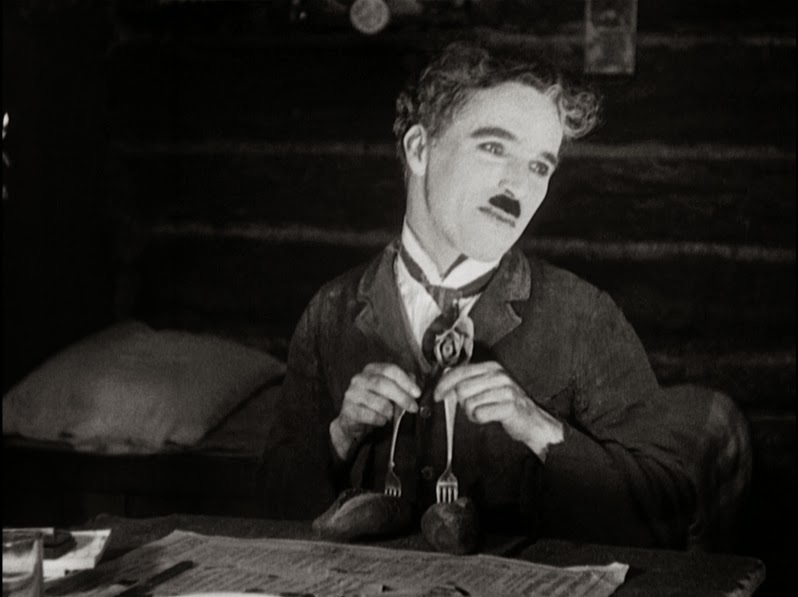 Chaplin’s direction is truly mesmerizing for not just the way he presents the world of the Klondike but also in the way he creates a world that seems dangerous but also add humor to these scenes. With Chaplin also narrating the film (for its 1942 re-release) to display some dialogue and such. It is still a silent film in the way Chaplin creates some moments that are very lively and tender such as a fantasy scene where the Tramp entertains Georgia and her friends at a dinner. Yet, there’s also some sprawling set pieces such as the scenes at the cabin in the mountains that includes a famous scene of the Tramp and McKay in the cabin that is teetering on the edge of a cliff. The usage of special effects to create that moment along with some scenes in the snow with its mix of physical humor adds to the brilliance of the presentation along with Chaplin’s use of wide and medium shots. Overall, the film is a truly entertaining story about a prospector searching for riches in the Klondike. Cinematographer Roland Totheroh does excellent work with the film‘s black-and-white photography from the look of the mountains and caves to the lighting in the saloon that the Tramp goes to where he meets Georgia. Editors Charles Chaplin and Harold E. McGhan do amazing work with the editing with its use of rhythmic cuts to play into the humor and romance. Production designer Charles D. Hall does fantastic work with the set pieces from the look of the saloon to the cabin at the mountains. Sound editors Harold E. McGhan and James L. Fields do nice work with some of the film‘s sound effects, that was added for its reissue, to play into the atmosphere of the locations. The film’s music by Charles Chaplin is brilliant for its very lively orchestral score that ranges from being playful to also serene in its somber moments. The film’s terrific cast includes some notable small roles from Henry Bergman as a professional prospector the Tramp meets in the film’s second act, Malcolm Waite as the flirtatious Jack Cameron who tries to win Georgia’s heart, and Tom Murray as the very secretive and cunning fugitive Black Larsen. Georgia Hale is wonderful as Georgia as a saloon girl eager to get out of Alaska as she befriends the Tramp and is intrigued by his kindness as she also deals with some of her own issues. Mack Swain is great as Big Jim McKay as a prospector who has found gold as he befriends the Tramp while dealing with his hunger and the presence of Black Larsen. Finally, there’s Charles Chaplin in a remarkable performance as the Tramp where he brings in a lot of great physicality to his comedy while doing little things that add a sweetness to his character. The Gold Rush is an incredible film from Charles Chaplin. Thanks to its fun premise and top-notch visual effects, the film is definitely one of Chaplin’s finest films. Even as it showcases the kind of ambition he would put into a silent film and make it so much more. In the end, The Gold Rush is a marvelous film from Charles Chaplin. Incredible is right! Love this movie. One of his finest (The Kid is still my favorite). I just love Chaplain!!! Thanks. I do love this film though I think Modern Times is my favorite right now as I'm going through many of the Chaplin's great films with three more in my DVR queue to watch. I agree it's one of Chaplin's best. Scene with dancing feet(your header image) is just perfect cinema. Also, never has the wind blowing through a door been used to such great effect. @Chris-It is perfect cinema. You can't any better than Chaplin having rolls dancing.